According to Joseph Addison, an eighteenth-century journalist and critic, the Gothic contained "all the extravagances of an irregular fancy." 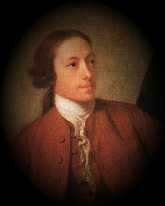 Although Addison meant this as a criticism, for the Romanticists of the next generation it was a compliment. For them, the term "Gothic" suggested whatever was medieval, natural, primitive, wild, free, authentic, romantic, various, rich, mysterious. The word "Gothic" originally referred to the Goths, a Germanic tribe, then came to signify "Germanic," then "medieval." Thus, originally most Gothic novels were set in the middle ages; now the term refers more to atmosphere and setting. Often such novels incorporate events which are uncanny or macabre or melodramatically violent, and they often deal with aberrant psychological states. C. Hugh Holman's Handbook to Literature notes that "magic, mystery, and chivalry are the chief characteristics" of the Gothic novel. The atmosphere is often brooding and filled with unknown terror. Horrors frequently abound: a suit of armor may come to life; ghosts, complete with clanking chains, may walk the halls of a castle; women may be entombed in dungeons. Frequently the emphasis is on setting and story rather than characterization. a castle, ruined or intact, haunted or not. ruined buildings which are sinister or which arouse a pleasing melancholy. dungeons, underground passages, crypts, and catacombs which, in modern houses, become spooky basements or attics. labyrinths, dark corridors, and winding stairs. shadows, a beam of moonlight in the blackness, a flickering candle, or the only source of light failing (a candle blown out or an electric failure). wild landscapes, like rugged mountains, thick forests, or icy wastes, and extreme weather. magic, supernatural manifestations, or the suggestion of the supernatural. a passion-driven, wilful villain-hero or villain. a curious heroine with a tendency to faint and a need to be rescued frequently. a hero whose true identity is revealed by the end of the novel. 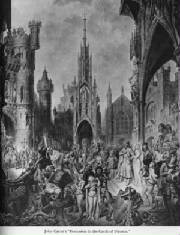 The English Gothic novel began with Horace Walpole's The Castle of Otranto (1765), which was enormously popular and quickly imitated by other novelists and soon became a recognizable genre. 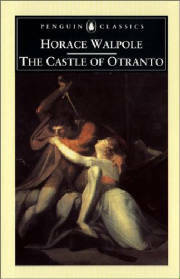 To most modern readers, however, The Castle of Otranto is dull reading; except for the villain Manfred, the characters are insipid; the action moves at a fast clip with no emphasis or suspense, despite the supernatural manifestations and a young maiden's flight through dark vaults. But contemporary readers found the novel electrifying original and thrillingly suspenseful, with its remote setting, its use of the supernatural, and its medieval trappings, all of which have been so frequently imitated and so poorly imitated that they have become stereotypes. The genre takes its name from Otranto's medieval–or Gothic–setting. and overview of Gothic literature. all aspects of the Gothic.